The most cost effective way to wash every area of your boat -from stern to bow! 1:32 dilution ratio! Dilute 1 ounce with 32 ounces of water! Marine 31 Stern to Bow Waterless Wash & Wax Concentrate with Carnauba is the environmentally conscious solution to boat washing and waxing. It will save you time, save the environment from chemical and water waste, and coat your vessel's exterior with a high-gloss carnauba wax finish. Marine 31 Stern to Bow Waterless Wash & Wax Concentrate with Carnauba works without a hose or running water making it the perfect choice to clean your boat in the dock or when it is anchored to the ocean's floor. This go-anywhere wash solution eliminates water waste and is fast and easy-to-use! 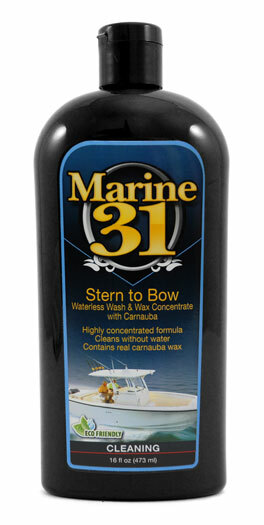 Marine 31 Stern to Bow Waterless Wash & Wax Concentrate with Carnauba rewrites the rules on boat washing! There is no need to use a hose or running water. Marine 31 Stern to Bow Waterless Wash & Wax Concentrate with Carnauba gets its cleaning power from advanced polymers that attach to any soiling on your boat's surface, as well as the boat itself. This breaks dirt's bond and allows it to be wiped away without scratching or dulling the finish. Marine 31 Stern to Bow Waterless Wash & Wax Concentrate with Carnauba imparts a highly protective, high-gloss shine on your boat, plus powerful UV protection with each use. Your boat is constantly bombarded by its environment. Water, salt, and then sun can dry out and age any surface quickly. Despite having the power safely clean salt spray, Marine 31 Stern to Bow Waterless Wash & Wax Concentrate with Carnauba remains gentle to your boat's surfaces, particularly the gel coat, to prevent them from drying out. Formulated with premium carnauba wax, this waterless wash solution leaves behind a slick, high-gloss carnauba-based coating that repels dirt and sheds water. Regularly cleaning your hull with Marine 31 Stern to Bow Waterless Wash & Wax Concentrate with Carnauba will help it glide through the seas with ease. Frequently cleaning your boat or personal watercraft with Marine 31 Stern to Bow Waterless Wash & Wax with Carnauba will keep it protected and looking its best. Salt, barnacles, and mildew will have a hard time adhering to the waxed finish. Carnauba wax's natural UV absorbers will reduce gel coat chalking and prevent oxidation. Enjoy the open waters in a clean and protected vessel cleaned with Marine 31 Stern to Bow Waterless Wash & Wax Concentrate with Carnauba! Marine 31 Stern to Bow Waterless Wash & Wax Concentrate with Carnauba is fully biodegradable and harbor-safe. Add 1 ounce of product into a spray bottle containing 32 ounces of water.